This is quite a stunning work from Gautam Ghose. ‘Antarjali Yatra’ was based on a story by Kamal Kumar Mazumdar. Revolving around certain age old Brahmanical beliefs, the story unfolds to reveal an alliance set up between a pretty, young woman (Shampa Ghosh) with a dying nonagenarian Brahman (Pramode Ganguly), and the attempts of an untouchable ‘Chandal’ (Shatrughan Sinha in a never seen before performance as the untouchable entrusted with the last cremation rites) to save the young woman. When the father (Vasant Choudhury) of Shampa declares that his daughter may suffer in this life and forced to a ‘Sati’ but she will attain eternal bliss in Heaven, it is a flashback for us to the deep rooted beliefs of the era which was just about a century and a few years back .. The film is rife with long shots, and the cinematography is mesmerizing. 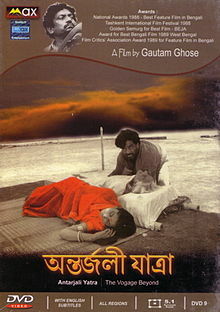 The others in the cast include Robi Ghosh, Vasant Choudhury, Mohan Agashe and Kalyan Chaterjee.